Today is Monday, three days out from surgery. First, a couple of details from my surgery that I haven’t recorded yet. 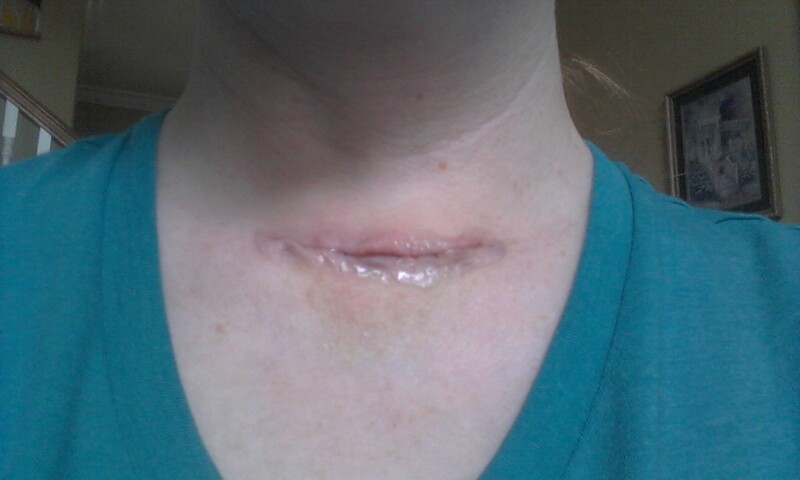 My parathyroid glands on that side did great, according to Dr. B. So that’s a definite positive. Also, the “other” nodule, the one that initially was more scary on ultrasound but came back with a benign FNA still looked benign on frozen section. Of course, I still want to see the report on it, but I am not worried about it at all. We are still nursing in the morning. I’m kind of glad I can provide that kind of continuity for Eleanor during this time. Bless her heart, it’s hard when Mommy has a big boo boo on her neck and can’t pick you up. We’ll get that last feeding gone sometime. One thing I didn’t think through before surgery was making sure I had enough scoop-neck and v-neck t-shirts to wear for the first little while. 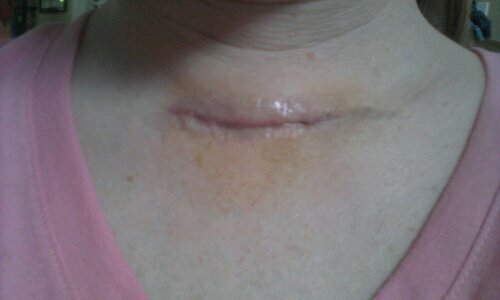 Down the road, I am going to be glad my scar is low enough for a regular t-shirt to cover it, but right now having something against it doesn’t feel great. Also, I am not having much pain at all today. Really, my pain has not been bad from the beginning. But I have still been feeling sort of crummy and tired. Ever since I got home, I’ve felt like I might have a little fever. Today I finally checked it, and it was 99.3. Not too high, but enough to make me feel punk. My discharge instructions say to call if I have fever over 100.4. So I’m not too worried about it, but will keep an eye on it. I’m also faithfully taking my antibiotic, even though I wasn’t originally sure that I would. Dr. B, when he saw me the morning after surgery, said that it was mostly precautionary since they wouldn’t be watching me in the hospital. But that first day home, when I first started feeling a little hot, I decided to go ahead and take it. I have been coughing some (not super comfortable, but normal, from what I’ve read), and my throat feels a bit more “gunky” on the inside today. So I’m now sucking on On Guard throat drops. One question I’ve had is whether I will be up to teaching my childbirth class tomorrow night. Part of me says that I don’t feel that bad and not to be a wimp, but my rational brain is telling me that I’m still mostly affixed to the couch and don’t need to push it. I just dread trying to make the class up. Maybe by Friday I will be feeling better? My follow up appointment is scheduled for Friday morning. The old me, pre-surgery, would not have been content to just wait until my appointment to find out what my pathology report said if there was any way to know earlier. The new, just-trying-to-get-over-this-surgery-and-a-little-scared-I-might-need-another-one me, is going to wait. 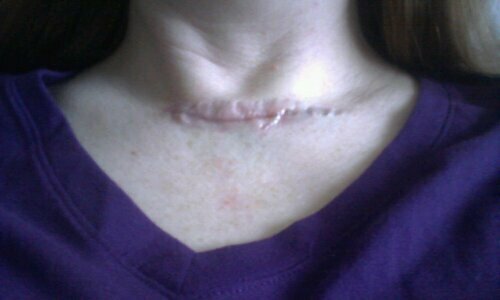 If I need to know before Friday, say, because we need to schedule a completion thyroidectomy, I am confident that Dr. B will contact me. About that. I am ashamed to say that I am having a hard time praying right now. Is my faith really that wimpy? I think I am a scared to pray very hard that my lump is not cancer because I don’t know if God will spare me this, and it’s hard to be disappointed that way. I KNOW he knows what’s best and what will work out for my ultimate good. I know he can use whatever Satan throws at me to refine and shape me into the person he wants me to be. I just really don’t want to have Hurthle cell cancer! “Let this cup pass from me!” I want to say. I should say it. I’m just afraid His answer might not be what I want it to be. That’s not to say that I haven’t been praying at all. I just haven’t been doing the kind of serious intervention type prayers I normally do when there is something big going on. May He have mercy on me in my weakness and give me the strength to turn to Him the way I need to. The really, really good news is that I know there are a lot of people praying for me right now. Obviously, that doesn’t mean that I don’t need to pray too, but it’s very wonderful and comforting to know. Also amazing and comforting is the meal list that Mrs. D put together for us…we will be getting meals EVERY NIGHT for the next 10 days. I think it’s way more than we will need, but I am SOOOO thankful. It will make things so much easier on Rusty. My dear friend R is coming in tonight on her whirlwind visit from Brazil. She and her kiddos will only be here in the evenings, so we decided not to cancel her stay after my surgery was scheduled right before her visit. She generally uses us as a hotel while she visits with her in-laws in a nearby city, getting in two visits at once. She called me to let me know that her husband’s grandmother, who has been sick for a long time, passed away this morning. So she will likely be here another day or two beyond what she originally thought. I am sad that they have this loss to face, but glad that I will get a little more time with her.